Hey, guys. Sorry if it’s been several days since one of us posted. We went on a little adventure! Heath loves to play disc golf (which I’ll get into in a minute) and has tried to teach me how to play numerous times, but I just can’t seem to get the hang of it. I do like trying to play, though, and I think all that matters is that we have fun doing it. Anyway, I’m originally from Fort Payne, which is a very small town in northeast Alabama. I haven’t been home to visit family in awhile so we decided to take a road trip down for a few days and see everyone. Heath has been to Fort Payne numerous times with me and always seems to get a little restless because there’s not a whole lot to do but sit and chat with people. He did a little research and found out that Cloudland Canyon State Park was less than an hour away in the northwest corner of Georgia. So we rounded up my mom and dad, the dogs, and some disc golf gear and drove up to this amazing park for the day. Boy, was it beautiful! The minute we got there we wished that we had brought all of our camping gear and could stay for a few days to explore. We will definitely be making another trip down in the near future to do that. Back to disc golf. 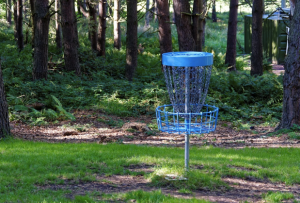 Some people call it frisbee golf, some call it frolf. It’s very similar to playing a game of golf, but you use specially designed frisbees and you try to land them in special baskets. I posted a picture up top so I don’t have to try to explain what the basket looks like…that would be a disaster! The frisbees or “discs” as Heath calls them are hard, thick plastic. Apparently, each type of disc and the type of plastic they are made from determine how they will fly through the air. Some have thicker lips around the underside, some are lighter weight than others, some are shaped slightly different. Heath owns about 50 different discs which has always made me think that maybe he is slightly obsessed with the sport (sorry, hon) but according to him and many other disc golfers, they are all necessary. They all carry these enormous backpack type bags with at least 20-30 discs in them all over the course, and then spend several minutes picking the perfect disc before setting up to throw it. So there is typically a concrete “tee pad” marked off with a sign that gives the player an idea of where the basket is and sometimes the distance is posted. Sometimes there are beginner’s baskets and pro baskets for the same hole. The distance ranges anywhere from 100 feet away to 600 feet away. You try to get a powerful “drive” from the tee pad using one of the driver discs. Once everyone in the group has thrown, you walk the course until you find where your disc landed. You then take turns making another throw, usually with a mid-range disc to try to get as close to the basket as possible. If you’re any good at the sport, you’re pretty close to the basket at this point. If you’re not good, however, just keep throwing until you get close, or better yet, make it in the basket. Then it’s time to use a putter disc to end the hole. The rules are the same as golf, the scoring is the same, you’re just throwing a frisbee disc instead of hitting a golf ball. So we played disc golf all day, my parents had a blast, we enjoyed the beautiful scenery in the park, had a picnic on top of the mountain, and eventually drove back to Fort Payne that evening. Like I said above, we will definitely be planning a camping trip back to this state park in the near future!